Elves are an ancient race that has populated the world long before man-kind ever existed. It was largely the cunning of elven magic that broke the dominance of dragons and sent them retreating into their lofty mountain caverns and other hidden lairs. Now a great majority of the elves have retreated with the onslaught of humans to seek seclusion within their quieter forests. Now as humans continue to expand, covering the world with great cities and masses of farmland, the number of elves has dwindled to a fraction of what it was a thousand years ago. Most now live within the forest of Isilme and shun the world outside their borders. Due to an ancient strife and bloody wars among humans and elves, the elves of Isilme treat most humans encroaching upon their forest home as enemies. There are few greater penalties among the elves then being shunned, or cast out from their home. They hold a deep sense of culture that few can bear to part from and so it is rare for an elf to venture willingly out from their forested seclusion. Those few elves that do venture from their homeland to consort with humans are usually labeled as Outcast and Renegade, and are seldom welcomed back once they have received the taint of socializing with humans. Elves are well known for their love of song and poetry. They revere things of natural beauty and the fine arts. They have a fondness of moonlight and stars, of dance, lore, and of the magical arts. Elves quickly reveal a more deadly nature when they or those they love are threatened. Their skill with the bow is a legend among humans. When friendships are formed, elves take great value in it and will go to great lengths to protect it, even to the sacrifice of their own lives. Elves also have very long memories and rarely forget or forgive a wrong done to them. Elves have a long and lasting respect for life. They view killing of any sort as distasteful and a waste. Only when stirred to vengeance for a great wrong done to them will an elf thirst for the blood of their enemies. Though most elves will hunt for food they are saddened by the loss of life and yet see it as a necessary part of nature. With their unearthly grace and fine features, elves appear hauntingly beautiful to humans and members of many other races. They are slightly shorter than humans on average, ranging from well under 5 feet tall to just over 6 feet. They are more slender than humans, weighing only 100 to 145 pounds. Males and females are about the same height, and males are only marginally heavier than females. Elves’ coloration encompasses the normal human range and also includes skin in shades of copper, bronze, and almost bluish-white, hair of green or blue, and eyes like pools of liquid gold or silver. Elves have no facial and little body hair. They favor elegant clothing in bright colors, and they enjoy simple yet lovely jewelry. Your elf character has a variety of natural abilities, the result of thousands of years of elven refinement. Your Dexterity score increases by 2. Elves mature slowly, and only after they have seen their first century are they even considered ‘adult’, but age among elves is hard to judge by appearance alone. Even the most ancient of elves rarely show more then a few subtle hints of age in their physical appearance. It is usually their eyes that show the often burdensome weight of time. In human terms elves are practically immortal, and though it is true that to the elves the passage of centuries is like the passing of a few seasons for humans, elves do in time feel a deep call to part from the world. An elf can typically live through the passage of a dozen centuries before succumbing to a longing to part from the world. Where they go is a mystery even to the elves, but rarely does an elf linger in the world long enough for old age to take them. It is also their extremely long life-span that gives them exceptional patience. They are slow to make judgement, and slow to change. They tend to remain aloft from the changing world around them. Elves are also slow to form friendships, and due to the shorter life-span of humans elves rarely form any bond of friendship with them. To humans this is often mistaken for arrogance and pride. Elves love freedom, variety, and self-expression, so they lean strongly toward the gentler aspects of chaos. They value and protect others’ freedom as well as their own, and they are more often good than not. The drow are an exception; their exile into the Underdark has made them vicious and dangerous. Drow are more often evil than not. Elves range from under 5 to over 6 feet tall and have slender builds. Your size is Medium. Your base walking speed is 30 feet. Accustomed to twilit forests and the night sky, you have superior vision in dark and dim conditions. You can see in dim light within 60 feet of you as if it were bright light, and in darkness as if it were dim light. You can’t discern color in darkness, only shades of gray. You have proficiency in the Perception skill. You have advantage on saving throws against being charmed, and magic can’t put you to sleep. Elves do not sleep, as members of the other common races do. Instead, an elf meditates in a deep trance for 4 hours a day. An elf resting in this fashion gains the same benefit that a human does from 8 hours of sleep. While meditating, an elf dreams, though these dreams are actually mental exercises that have become reflexive through years of practice. The Common word for an elf’s meditation is “reverie”. You can speak, read, and write Quenta and Dani. Elven literature is rich and varied, and their songs and poems are famous among other races. Many bards learn their language so they can add Elvish ballads to their repertoires. You have proficiency with the longsword, shortsword, shortbow, and longbow. Often referred to as high elves do to their mild arrogance and noble demeanor, the Sylvani tend to be fair of skin compared to humans. Their eyes are typically golden, silver, or black, but can also be of any color found in humans. Sylvan elves tend to be recognized as the most civilized of the elven sub-races. Though most elves tend to shun man-kind, Sylvan elves are more typically repulsed by all other races, and to a much lesser extent this would even include other sub-races of elves. Your Intelligence score increases by 1. Sylvan elves have a strong affinity towards magic. You know one cantrip of your choice from the wizard spell list. Intelligence is your spellcasting ability for it. You can speak, read, and write one extra language of your choice. The Ithilani are much paler, with faces of bleached white tinged with blue. 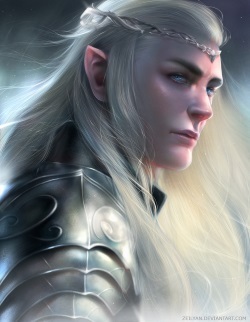 They usually have hair of silver-white, black, or blue, though all the reported colors normally found in men and elves may be found in this race. Their eyes are blue or green and have gold flecks. They tend to tolerate men the most of the elven sub-races and the majority of adventuring elves and half-elves are of moon elf heritage. Moon elves can sometimes be referred to as silver or gray elves though the later term would be taken as an insult, especially if given by another elf. Your Charisma score increases by 1. You are proficient in the Stealth skill. In addition, you can attempt to hide while you are only obscured by dim light. You know the minor illusion cantrip. When you reach 3rd level, you can cast sleep as a 2nd-level spell once with this trait and regain the ability to do so when you finish a long rest. When you reach 5th level, you can cast the moonbeam spell once with this trait and regain the ability to do so when you finish a long rest. Charisma is your spellcasting ability for these spells. The Taurani (also called wood elves, forest elves, and wild elves) are reclusive and distrusting of non-elves, in particular human kind. Wood elves have keen senses and intuition, and their fleet feet carry them quickly and stealthily through their native forests. They tend to have a close affinity with nature and woodland wildlife, often preferring the company of animals than others of their own kind. Wood elves often have slightly darker skin then their other elven cousins (except for the Drow). Their hair tends toward browns, and blacks with occational blondes, and may contain green highlights. Their eyes are typically green, brown, or hazel. Your Wisdom score increases by 1. Your base walking speed increases to 35 feet. You can attempt to hide even when you are only lightly obscured by foliage, heavy rain, falling snow, mist, and other natural phenomena. Elves consider humans rather unrefined, halflings a bit staid, gnomes somewhat trivial, and dwarves not at all fun. They look on half-elves with some degree of pity, and they regard half-orcs with unrelenting suspicion. While haughty, elves are not particular the way halflings and dwarves can be, and they are generally pleasant and gracious even to those who fall short of elven standards (which, after all, consists of just about everybody who’s not an elf). Elves have a difficult time classifying humans. Many humans are friendly and even a little in awe of elves. Others are bigoted and unfriendly, even downright hostile. While other races have variations in their racial makeup and general views, none are as varied as the humans. This means that elves will regard every human they meet with some degree of suspicion until that human has proven him- or herself a friend. Elves, despite their many accomplishments, are amazed at humans. Humans are prolific producers of children, and many have incredible innate ability. Humans have managed to convert lands elves had once thought unlivable into homes. The elves are impressed-and perhaps a little frightened. Despite their constant bickering and warlike nature or perhaps because of it, humans now dominate the world. They have accomplished in a few short years what it took elves hundreds of years to achieve. It is because of the humans soaring population and expansionistic tendencies that elves find themselves retreating to the forests and secluding themselves from the world. The vast variance of human nature is enough that elves have no set reaction to them. Their variety confuses elves, and they stay away from humans as much as possible. Yenearsira – Winter Solstice, the Elven new year. A day of rebirth. Sheelala – A day of games and practical jokes celebrated in early spring. Ehtele’mele – Vernal equinox. A week of romance and song. Faradome – Summer Solstice. A celebration of the battle between Corellon and Gruumsh One-Eye. A night of orc hunting. Yavieba – Autumnal equinox. A week of reflection and a time to remember those who have left this world. Most important decisions and judgments are made during this week. Saerloonian Glowfire – pale wine, luminous, taste reminiscent of pears. Saerloonian Topaz – yellow amber wine w/ nutty quality and bold fruit overtones. Mead – sweet wine of fermented honey. Elverquisst – a ruby-colored liquor magically distilled from sunshine and rare summer fruits. Utterly smooth, the liquor is nonetheless flecked with gold and has an iridescence of both color and flavor. It is highly prized at all times, but in the autumn rituals it is savored as if it is the gift of one final, perfect summer day. Evermead – THE elven mead. The one to which all others are compared and found wanting. Clarry – table wine blend sweetened w/ honey and spices. Arabellan Dry – fine red wine, very dry woodsy overtones and a slight berry taste. Berdruskan Dark – heavy sweet and burning, almost black, HIGH alcohol content. Morimatra – a spiced wine favored by the Drow. When an elf declares herself an adult, usually some time after achieving her hundredth birthday, she also selects a name. Those who knew her as a youngster may or may not continue to call her by her “child name,” and she may or may not care. An elf’s adult name is a unique creation, though it may reflect the names of those she admires or the names of others in her family. In addition, she bears her family name. Family names are combinations of regular Elven words, and some elves traveling among humans translate their names into Common while others use the Elven version. Male Names: Aramil, Aust, Enialis, Heian, Himo, Ivellios, Laucian, Quarion, Thamior, and Tharivol. 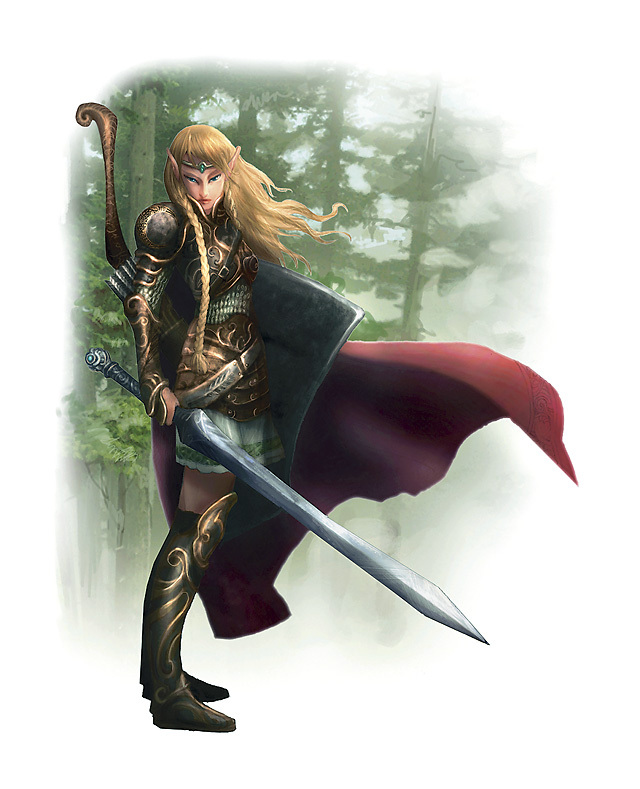 Female Names: Anastrianna, Antinua, Drusilia, Felosial, Ielenia, Lia, Qillathe, Silaqui, Valanthe, and Xanaphia. Family Names: Amastacia (“Starflower”), Amakiir (“Gemflower”), Galanodel (“Moonwhisper”), Holimion (“Diamonddew”), Liadon (“Silverfrond”), Meliamne (“Oakenheel”), Naïlo (“Nightbreeze”), Siannodel (“Moonbrook”), Ilphukiir (“Gemblossom”), and Xiloscient (“Goldpetal”). While Drow elves, or Morani, may also be referred to as dark elves by humans, ‘dark elf’ is a term that other elven sub-races give to all outcasts after having been banished or shunned by the elven populace. While the Drow would certainly fit this description, the term does not specifically refer to them. Drow have black skin that resembles polished obsidian and stark white or pale yellow hair. They commonly have very pale eyes in shades of lilac, silver, pink, and blue. They also tend to be smaller and thinner than most elves. The drow are the darker and more sinister cousins of the elves, and are now shunned by all other races. They are crafty and cunning, and though they hold a perverted love for things of beauty, their tastes tend to favor that which is brutal, savage, and yet holding towards elegance. Before the Sundering the various sub-races of the elves had lived in peace, but the drow’s endless greed for power drove them to delve deeper into the darker forces that eventually lead to their corruption. Though the fairer elves tried to divert the drow from their inevitable downfall, the drow only saw it as an attempt to subjugate them, and turned on them. Convinced that the drow had fallen into darkness, the fairer elves banded together to drive them from their land. Thus the Kinswar had begun, and for nearly a century the forests of Isilme was bathed in the blood of slain. Those drow that escaped death were driven deep below the surface, or fled to the high mountains and hid in secrecy. Most drow now make their home in the vast network of underground caverns that they call the Underdark. These drow shun the light and are rarely seen by light of day. They harbor a deep hatred for all other races, including the drow who remained on the surface. There was one city of the drow called Temet located in the high mountains East of Asgra that managed to survive the Kinswar. The hatred between the drow of the Underdark, and those of Temet are rife. ‘Shakrila’ is the term that the drow of Temet use in reference to their Underdark kin, meaning ‘Renegade’. They view the drow of the Underdark as weaklings and traitors who fled during the Kinswar. Though most drow of either Temet or the Underdark are evil, outcasts and renegades tend to have a more neutral attitude and have even come to gain some acceptance among humans. Rarely are drow ever trusted, especially by their own kind. Of all other races only the humans have come to tolerate any dealings with them, and a small number of drow from Temet occasionally venture into human lands for trade, some even to live. In Asgra and Ahk the drow have found a steady source of trade, but in most cities drow are still treated with deep suspicion and are often reviled. The fairer elves still shun them, and often try to slay them when they can, but they dare not leave their own lands to mount an invasion which would take them into the heavily guarded territories of the humans. Drow craftsmanship is truly a marvel to behold, wrought with strange and intricate designs that often betray their twisted sense of beauty. Also, much like their cousins, drow tend to excel at magic and war. Their pride and hunger for power drives them to greater achievements and status among their peers, often at the expense of their rivals. Either your Intelligence or Charisma score increases by 1 (your choice). Your darkvision has a range of 120 feet. You have disadvantage on attack rolls and Wisdom (Perception) checks when you, the target of your attack, or whatever you are trying to perceive is in direct sunlight. You know the dancing lights cantrip and can cast it at will. Starting from 3rd level, you can cast the faerie fire spell once. Starting from 5th level, you can cast the darkness spell once. Charisma is your spellcasting ability for these spells. You regain expended uses of this trait when you complete a long rest. You are proficient with the rapier, scimitar, and hand crossbow. You can speak, read, and write Undercommon. Some dark elves have spent enough time on the surface that they have become accustomed to the sunlight, at the cost of their enhanced vision in dark and dim conditions. If you wish to play such a dark elf, you lose the Superior Darkvision and Sunlight Sensitivity traits of the standard dark elf subrace above. Talenme’a is the primary home of the Sylvan elves. It is a city built among the towering trees within the heart of the Forest of Isilme and serves as the primary bastion of elven power within Tera’fir. 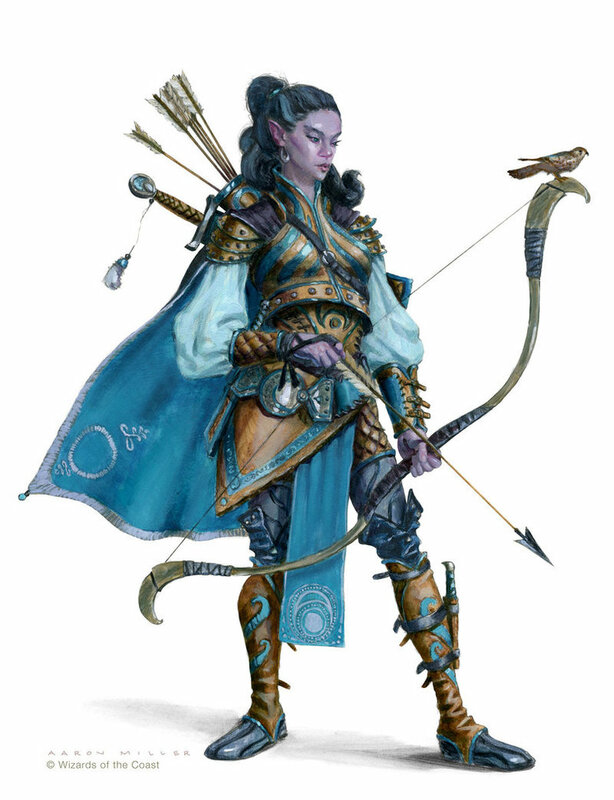 While other sub-races of elves make their home here (with the exception of the drow who remain their bitter enemies) the sylvan elves hold most of the positions of power and authority. While Moon Elves can dwell in any number of small settlements and villages within the Forest of Isilme, their primary home is the city of Meliamne near the South-Eastern portion of the forest. The Wood Elves have no settlements, and rarely gather together in sufficient numbers to even be called a small clan. Usually no more than a family of Wood Elves will ever live together and rarely do they build permanent structures. Most prefer to seek shelter in small caves, or in small grass covered huts within the bows of the trees if they build any structure at all. 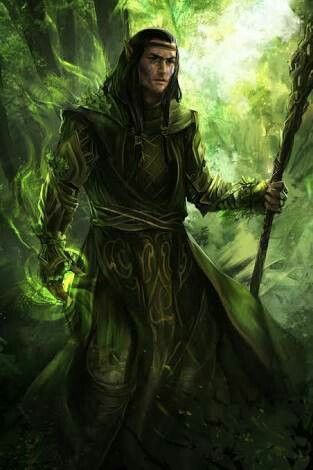 Most Wood Elves make their home within the more isolated sections of the Forest of Isilme, but some are known to live within the Lark Woods and the Droutian Forest. Those whom live within the Droutian Forest share their forest home peacefully with humans who are nearly as wild and reclusive as they are. Those Drow that don’t live deep within the Underdark can be found within the surface city of Temet. These drow live in relative peace with the humans and often journey to Asgra for trade, but otherwise they tend to shun the other races, including the drow that live within the Underdark.